You can do many things to make your bedroom safer. Some are obvious, others less so. Basic things to have are nightlights in the bedroom, a spare flashlight, and a phone with emergency numbers next to it. In addition, program those numbers to activate one number dialing. In case an oxygen tank is in the room, an oxygen warning sticker on the door is imperative. A loud call bell is also a good idea. And no area rugs to slip on. Now, let's discuss furniture and accessories. Your condition, or that of a loved one, dictates your choice of bedroom aids. Many people simply need a little help getting in and out of bed. Lowering or raising the bed may help. Beyond that, a hand bed rail that extends to the floor is a welcome aid. 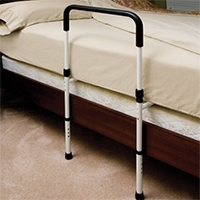 As its name implies, it is a sturdy rail that one leans on to get onto and off the bed. The bed rail is flat on top, with rounded sides, and it uses metal rods slipped between the box spring and the mattress for support. If falling out of bed is a problem, bed rails are the solution. They're made in a number of styles and they are usually incorporated as part of a fully electric hospital bed. Though these rails and beds are expensive, they help with a condition not solved in any other way. Falling out of bed can lead to injury and worse. Ask your doctor or insurance carrier if a bed can be prescribed. Medicare offers different options. Overbed tables allow plates, books, and other items to be safely within reach with little chance of things spilling on the bed. An extending arm holds a flat surface that can be pulled toward and away from the bed user. These tables are great for serving meals in bed. After use, they can be simply pushed away. A tilting overbed table is even more versatile, allowing for easy reading of books, magazines, and even a tablet or laptop. A wonderful thing for the bedridden to have is a reclining chair they go to when they feel the need to get up and change positions for a while. They are also very helpful when a care giver needs to tend to the bedding and must move the bed user. The problem is that recliners are usually bulky and heavy and often in the way in a small room. A proper clinical recliner, one on wheels, can be arranged anywhere in the room with little effort. Some even come with trays to hold a meal or a book. A few last tips. Think about getting some glow in the dark adhesive tape. Just a few strips on each piece of furniture or accessory will give you an instant idea of where these items are in the dark. And make sure the one in bed can easily turn the lights on and off. I mentioned the room needing a phone. A lighted dial is a very good idea. Also, consider mounting the television on the wall, on a swinging arm. This keeps the TV off the floor, not needing a stand or a piece of furniture for a mount. The less things in the way in the bedroom, the better. Looking over a medical supply catalog or showroom will give you even more ideas for a bedroom that is safe, more comfortable, and easier to use.